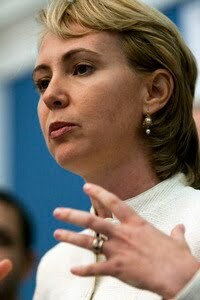 Rep. Gabrielle Giffords was re-elected to a third term in November. The Pima County, Ariz., sheriff's office told member station KJZZ the 40-year-old Democrat was killed. A hospital spokeswoman said Giffords was in critical condition and undergoing surgery. At least eight other people, including members of her staff, were injured.